Enjoy a luxurious experience in a beautiful setting! 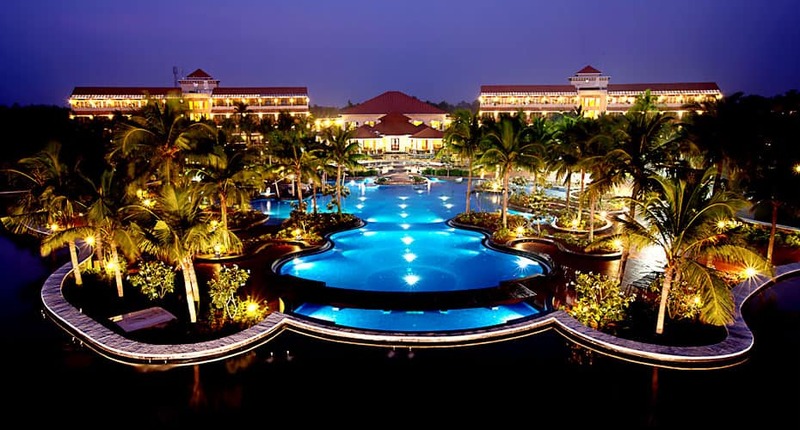 An idyllic beach resort - Ocean Spray, is located on ECR Main Road in Pondicherry. Featuring impeccable facilities and peerless services in a beautiful setting, this luxury resort is an ideal destination for both business and leisure travellers. The resort has a spa, swimming pool and a gym. It also has well-appointed conference rooms and a banquet space for corporate events and social gatherings. An activity centre is also available for recreation purposes. Other facilities include money exchange, car rental, travel desk, valet services, car parking and doctor on call. Sight-seeing arrangements are offered on request. Ocean Spray houses 72 rooms (Ferns, Cascade and Sky Jacuzzi) and 28 villas (Bermuda, Tahiti and Guadeloupe). Boasting of charming dcor and refined furnishing, room offer utmost relaxation. Most of the rooms offer magnificent views of the beautiful suburbs. In-room amenities include an air-conditioner, TV, Wi-Fi, tea/coffee maker, direct dialling facilities and an electronic safety locker. Villas are fitted with luxurious bath tubs bath areas. Room service and laundry facilities are available. The resort has 3 exclusive dining options. Tea Lounge, a 24/7 restaurant operates in a relaxed ambience, best known for a variety of hot cold beverages, fresh bakes and crunchy salads. Amber, a multi-cuisine restaurant featuring delightful indoor outdoor seating options, offers delicious global cuisines that include Indian, Continental and Mediterranean. Nearby attractions include Matrimandir (15 km), Sri Aurbindo Ashram (16 km), Manakula Vinayagar Temple (16 km), Pondicherry Museum (16 km), Bharathi Park (16 km) and Promenade Beach (16 km). Pondicherry Airport is 17 km and Puducherry Railway Station is 18 km away from the property. Pondicherry city centre is approximately at 18 km from the hotel. What makes this property a first choice among travellers is its exceptional setting and excellent services. Book Bonjour Bonheur Ocean Spray now and revel in the best! This is a tastefully decorated room with a cozy sit-out area, offering an uninterrupted view of the lush flora and serene lake. The decor includes double beds and a writing desk. A TV, a ceiling fan and a telephone are some of the amenities available inside this room. Located at the source of the water body, this room with a spacious balcony offers a clear, unobtrusive view of the surrounding landscape. The decor includes double beds, lampshades, a writing desk, a cabinet and a chair with a coffee table. There is also a lounge chair in the balcony for guests to rest and admire the beautiful surroundings. Book for 3 nights minimum & get 3rd night free on Breakfast Subject to availability. New years eve gala dinner included. This is an ultra-luxurious room located at the highest level and maintained with an open-to-sky Jacuzzi with earthy stone beams. The room offers a clear view of the sunrise on the sea and a breathtaking view of the lake. Designed with wooden ceilings and floors, the decor inside the room includes floor lampshades, a double bed, a TV cabinet and a chair with a coffee table. Reason For Rating : Cleanliness. Food. Reason For Rating : good ambience, excellent room service and its value for money. What's Good: It's a good place to stay and enjoy. What needs to improve : - Bed spring mattress was too soft, did not get good sleep, should be replaced by better quality - Some water areas were not clean and had dirty stagnant water - Club area was closed, so we could not enjoy it - Not happy with the standard of toiletries considering the level of the resort - Indoor playing area needs immediate maintenance, Table tennis rackets were broken and very old. ACs were not working properly etc. - There were 2 big spiders in our room which we reported at the reception also. Reason For Rating : - Good property, overall well maintained - Ample space for outdoor activities and big swimming pool BUT... - Some water areas were not clean and had dirty stagnant water - Club area was closed, so we could not enjoy it - Not happy with the standard of toiletries provided considering the price of room - Indoor playing area need proper maintenance, Table tennis rackets were broken and very old. ACs were not working properly etc. - There were 2 big spiders in our room which we reported at the reception also. Reason For Rating : Quiet beautiful resort.. Nice Jacuzzi suite.. lot of privacy... Good for couples for a day long stay.. As with any 5 star, food is quiet expensive although delicious. Reason For Rating : Excellent app for booking hotel...found wallet option at payment section is very useful. What needs to improve : Cleanliness and hygiene. Reason For Rating : Room quality is bad. Cleanliness and upkeep is a serious issue. What needs to improve : No description and guidance of services. Reason For Rating : Resort was good to stay with family..
Reason For Rating : Got a twin bed and put together as a single bed which was such a pain to sleep. Reason For Rating : Excellent ambience. Good service. Tide and neat. Reason For Rating : The swimming pool needs to be maintained better. The chlorine level in the water was too high. What needs to improve : Food is vey costly as compared to the quality & taste served. Reason For Rating : Best place to stay in pondy. What's Good: The ambience is great. What needs to improve : The prices of the outdoor can be reduced a little bit on weekdays. Reason For Rating : The hospitality was awesome.. I had booked heavens room. The room had a great view. Reason For Rating : Ambience, cleanliness, courtesy etc. Reason For Rating : It was very nice experience the ambience the location the lake the ducks the beach - breakfast all was very nice . Reason For Rating : Good hospitality. Nice admosphere. Well maintained rooms. Reason For Rating : Rooms and general ambience is good but food is highly overpriced. Reason For Rating : Good ambience, clean, variety of dishes for breakfast, courteous staff. Reason For Rating : best place to stay, service was great. Reason For Rating : It was an wonderful time we spent as a family for our 2nd anniversary. Rooms are really good wonderful swimming pool and star class restaurant. What's Good: Rooms, services and ambience. Reason For Rating : Nice stay. Reason For Rating : Over all Good experience in ocean spray rooms surrounding swimming is too good, breakfast was tasty with lost of varieties. And we booked by Yatra so we got the booking at Great discount its awesome!!! Going forward we though to book through Yatra for our family outing!!! Reason For Rating : The resort is very beautiful..!! One day stay is not be enough to explore all the facilities.. We had few hiccups after checking in related to house keeping services... Towels, face napkins, tea cups were not provided...we had to complaint to the on duty manager, so after almost an hour of wait we got them. But other than this, our overall experience was wonderful. The jacuzzi, bath tub, rooms are very nice!! What needs to improve : Food too costly. Outside PONDICHERRY. Reason For Rating : Very beautiful resort. Room very clean and extremely spacious. What needs to improve : Less activities. Reason For Rating : Food is expensive. Stay, amenities are good quality. Power failures happen often. Not many activities during weekdays. Nice and courteous staff, easy check-in checkout. Reason For Rating : It's a very good resort with nice interiors. Breakfast is good. We enjoyed at the swimming pool a lot. Room service and housekeeping staff is very helpful. One area which needs improvement is room AC. The AC in rooms not cooling the room properly even after the visit of their maintenance staff. Reason For Rating : Good ambience. Clean rooms. Good food. Courteous staff. What needs to improve : The lake is dirty amd not cleaned. The facilities can be improved. Reason For Rating : I had a pleasant experience. The stay was comfortable, the staff was polite and they tried to give their best service. The rooms are qyite spacious and good view. What's Good: Beautiful, well maintained property, very nkcr ang big pool. What needs to improve : Location is not that good, away from beach. Activities are limited. Reason For Rating : It was a great experience while staying at Ocean Spray. The hotel has a nice property with lush green and beautifully maintainesld surroundings. The rooms are quite spacious and they try to give you the best service. I liked my overall stay and might come back. Reason For Rating : Excellent property. Clean and neat. Spacious. Lot of things for kids. Pool is real nice and huge. Great ambience.. Definitely like and would recommend..
What needs to improve : No Private beach, recommend to have one which will add good flavour to the stay. What's Good: Property is really very good!! Nicely maintained..
What's Good: The facilities were brilliant. Swimming pool was superb. Had a child pool also with low depth. What needs to improve : The private beach was not very clean. The hotel should take the responsibility of keeping it clean. Connectivity was also not too good. What's Good: It's a resort not a business hotel, both guests and staff and management can be a little laid back. What needs to improve : So much water makes the place a bit humid, but I guess one can deal with it. What's Good: No proper description on website. However the staff gave us an upgrade. What's Good: The hotel was good. On the positives, the rooms were large, service was good, Good car parking facility, on the ECR highway so no need for asking for directions. The 2 ladies - managing front reception area and the banquets are formidable and it was because of them primarily a poor stay became good. Kudo to them. Sorry Forgot to ask their names. A few issues the hotel should have mentioned on the site, Beach is 0.5 Kms away after the hotel gates. The route passes through a roughly inhabited village, so dressing is a key. Saw a couple of families who walking bare foot thinking the beach is just beyond the gates. Food is average- if you are a foodie like and waiting for a wow moment move on to Pondicherry, which is around 12 Kms from the hotel. The write up is too good, and we had a very different idea of the room than what we got into. Really poor stuff, Mocktails is are horrendous - stay away. The hotel is in TN, so no cheap liquor. Carry your own, if that is one of the need of going to Pondi. Though not sure what else can draw you to Pondi. What's Good: This resort is a dead place and no activities or people. The hotel charges you for every single thing (Eg if you want to use an open space for dinner or simple decoration in the room). We took heavens room. The resort has an amazing ambiance but definitely worth the price. What's Good: Its a good hotel with beautifull landscape. A few additions is but must. Fridge is a must in every room espically in a hot climate like pondi. Some finer aspect in room decor like bathroom fittings. And the air conditioning needs to be worked on. Overall a good stay and one of the finer resorts near pondicherry. The rooms are spacious and good. The best part is that every room has a balcony with a lovely view. The pool is also good. There are a few outdoor activities at additional cost. The food (dinner) was really good. However the reception and room service can be more co ordinated. For a bottle of water I had to keep calling reception and room service one after the other. The breakfast spread was OK. However can improve a lot considering the 4* standard. Overall a good stay. Can be a lil better is what we felt. The property rejevunates you by its beauty.Amazing views from everywhere. Staff is so friendly and makes you comfortable. Really one of a kind. Food & service is also commemdable. Worth it. Will love to visit again. It was my second stay at Ocean Spray, came here after a few years and I see the service and the place is as good as it was the last time around. This time I visited with my family, we all enjoyed our stay. The room was clean and well maintained, the housekeeping staff were courteous and very helpful, the facilities at the resort were top notch (except for one thing, more details below). I was particularly impressed by my interactions with Sunil, he was super good.. understood my needs, and that our my family, and did all he could (going out of his way at times) to make our stay memorable and enjoyable, Thank you, Sunil. The one thing I would like to see improved is the restaurant service, the service is delayed and I felt that restaurant can be a bit better managed..that said the food was tasty and food options were satisfactory. All in all a great place, fantastic service, well maintained rooms and swimming pool, and very good stay. I look forward to going back there soon. It was a pleasant stay @ Ocean spray with cool ambience & sumptuous food. Thanks to Manikandan and entire team for their kindness & good hospitality. Good place for family stay. Regards Sengu & Family. Ask for jacuzzi rooms on 4th floor. They are better then the rooms on 2nd floor.